nice clean lean and green minerality and fruit. Level of concentration much better here, the wines actually have character and depth to them. Wonderful balance but certainly more to them. Higher level of concentration of fruit, still very restrained and clean, minerals beginning to poke through. Richer depth and length, late minerality. Great balance with weight and crispness, very harmonious on the palate, nothing really sticking out at all. Wonderfully lifted minerality, struck-match, very delicate and fine, elegant, a little bit closed for now. Quite an explosion in the mid-palate, really great brightness and concentration of fruit, lovely clean mineralic finish, elegant but also full and rich. Less but somehow more mineralic, not struck-match but almost a green minerality(?) Like the Chablis showing some agave notes on the nose. Similar density but much more structure. Lifted above the palate, tighter and more brooding. Really intense flint struck-match minerality on the nose, almost blanketing the fruit at the moment. Wonderful volume, fills the mouth without invading it, a little wild and unchained, but still pure and balanced. 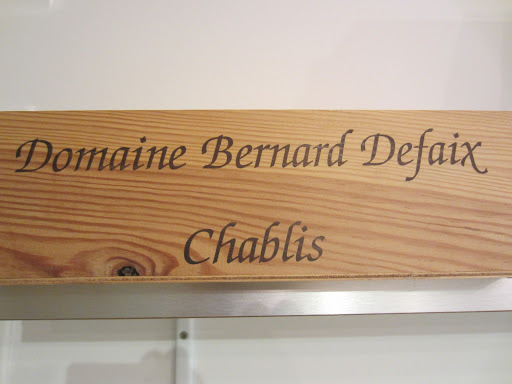 This is a slightly different expression of Chablis, I like the risk-taking attitude towards them, especially as it pays off. Very subtle and closed, intense brooding. Powrful explosion on the palate, hugely concentrated acids and fruit without being open, looking a little warm and aggressive at the moment, will open up over a much longer period. The difference is noticeable between the vintages. Subtle and subdued again, I wonder what treasures await… very complex, almost hauntingly subtle, very gentle but restrained jubilation. Serious acidity. Much better balance and integrated of fruit and acidity, alcohol very well contained as well. Great cellaring potential.